Oak tree planting requires a little more soil preparation than with other trees, especially if you live in an urban or suburban environment. Oak trees thrive in specific soils. You can easily recreate such a soil in the landscape for happy, healthy oak trees. Beloved for their graceful shape by homeowners, selected by city planners for their long tap roots that don't disturb sidewalks, and coveted by the lumber industry for their hardwood, oaks provide something for everyone. Oak trees are deciduous hardwood trees with toothed leaves. The majority of oaks lose their leaves in the fall in a shower of scarlet and brown. Oaks produce acorns in the fall, which can germinate into new oak trees. Oaks can live for hundreds of years. On Long Island, New York, the famous 'black oak' in Lloyd Harbor was estimated to be at least 400, if not 500 years old. Oaks can soar up to thirty, forty or more feet in height and develop a pleasing shape without any pruning. For the best results, schedule oak tree planting for either fall or spring. The cool temperatures ease the tree's transition and enable it to develop strong roots. There are many varieties of oak trees. Here are a few of the most popular varieties planted in the United States. These are hardy for most gardening zones. Live Oak (Quercus virginiana): Among all the oaks, the Live Oak retains its leaves year round and is thus the only evergreen type of oak. It grows mostly in the warm southern United States in zones 7 through 10. It can grow as tall as 60 feet and as wide as 150 feet if they have enough room. Red Oak (Quercus rubra): Red oaks are often planted by municipalities as street side trees. They provide great shade and lovely leaves in the fall. Plant red oaks anywhere from zones 4 through 7. They easily grow to be 100 feet tall and 40 feet wide with a nice rounded shape. White Oak (Quercus alba): White oaks are another popular tree found in suburban landscapes. They thrive in many locations and can grow to be 100 feet tall. The foliage of the white oak appears in springtime in a distinctive pink-gray color, changing to green. White oaks are difficult to transplant and are best grown from acorns in the exact spot where you want them to thrive. Pin Oak (Quercus palustris): Pin Oaks do well in zones 4 through 8 and transplant well. They adapt easily to city conditions, clay soils, and almost anything thrown at them. The only thing they don't like is an extremely alkaline soil. Choose a spot for your oak tree that's far enough away from the house, power lines, or outbuildings so that as the tree grows, its branches won't get tangled in anything important and it won't be in danger of falling onto a building. Remember that oaks can grow very large, so space it away from other trees as well, leaving at least twenty feet or more of space between the oak tree and its nearest neighbor. Of all trees, oaks have strong preferences for their soil. Oaks have developed a symbiotic relationship with a living organism called beneficial mycorrhizal fungi. Mycorrhizal fungi live among the roots of plants and provide plants with minerals and moisture in exchange for sugars exuded by the plant. Tree Help provides a thorough description of this intricate relationship between fungi and oak trees and explains why soils, especially urban soils, may not be adequate for the stately oak. Amend soil with special substances or a heavy application of compost and manure to improve the quantity and quality of the naturally occurring soil fungi. After choosing and receiving an oak tree from a reputable nursery, garden center or mail order company, select the location for the oak tree. Dig a hole twice as wide and deep as the root ball. The root ball may be wrapped in burlap or another covering. Remove the covering and place the tree in the hole. Be sure the tree is standing straight and tall. 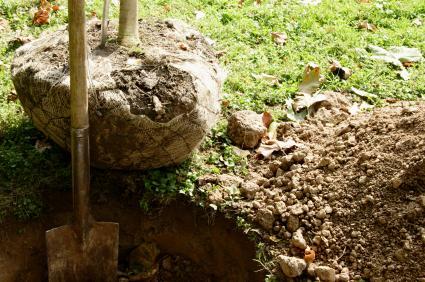 Add or remove soil to ensure the tree is tall. Mix a good compost in with the soil you've removed from the planting hole, then fill in the hole, tamping down the soil with your shovel or foot until it's firm. Water thoroughly, allowing the water to really soak into the ground. After planting, spread mulch around the base of the tree. Be sure to water the tree weekly, especially through the hot summer months, if less than an inch of rainfall per week is available. Acorns are plentiful, and you can easily plant an oak tree from an acorn. Oaks grow very slowly, so it's going to be many years before the tree attains the majestic height you see on mature trees, but you can easily add many oak trees to your landscape this way. For tips on planting oak trees from acorns, please visit one of the following sites. Los Angeles Parks Department provides a PDF guide to planting oaks from acorns. Wild Birds also provides information on planting oaks and acorns. University of California also provides a PDF on how to plant acorns to grow oaks.